One architectural engineering company is transforming the way the world works by delivering products and services that connect the physical and digital worlds. Core technologies in positioning, modeling, connectivity and data analytics enable customers to improve productivity, quality, safety and sustainability. When the company’s director discovered its software was being pirated, he began looking for solutions to stop the piracy. In 2007 the director of the company discovered its software was being pirated when several of his clients told him that they knew some of their competitors were using the software illegally. In addition, users who were not customers were contacting the company for product support. At the time, the director was unaware of the magnitude of the issue, but knew that it was serious and he needed to look for ways to rectify it. He began investigating software piracy on his own time, almost as a hobby. Once he learned how serious the problem was, he brought it to the attention of senior management. Management didn’t fully recognize the magnitude of the problem and were worried about the impact any anti-piracy program would have on their legitimate software customers, so It took the director several years to convince them that something had to be done. The first stage of the program revealed that piracy was happening and that the extent of it was huge. That information in itself took some time to digest. Subsequently, the compliance team tried to develop some models that would help them estimate the potential monetary value of product being lost to piracy and the potential for recovery if they were to embark on a license compliance program. 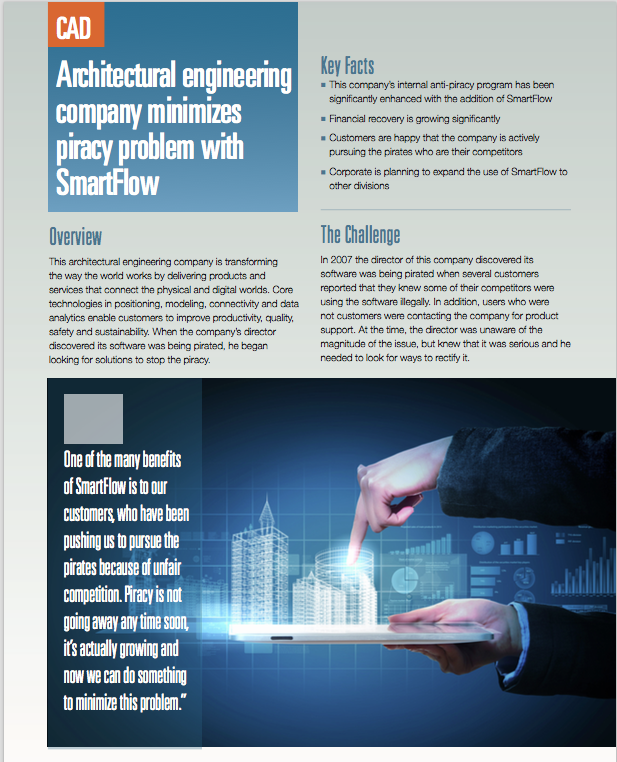 SmartFlow has complemented and upgraded the company's anti-piracy program immensely. The financial recovery is growing, which the director appreciates since piracy is also growing. Another positive impact is that legal customers are very happy that the company is pursuing the pirates who are robbing the industry and creating an unfair competitive advantage. The company is so satisfied with SmartFlow that the product is planned for wide distribution throughout the entire organization. “We have a very good relationship with the SmartFlow team. The service they provide is exceptional. We have worked with them in brainstorming and development and they bring even better ideas that our company needs. We can already see the benefits of some of these changes. It is nice working with the SmartFlow people because they listen and explain why we can’t do some things and how we can do other things.